Airport officials say the incident occurred when the aircraft was attempting to land in a bad weather. Tthe plane skidded off the runway in the process of landing at about 10:00 am local time on Saturday. All three crew members said to have been on board cargo plane flight no. ETEQV survived the incident and are currently receiving treatment at the 37 Military Hospital in Accra. Bad weather is thought to have contributed to the crash landing incident although Ghanaian authorities have not confirmed this. 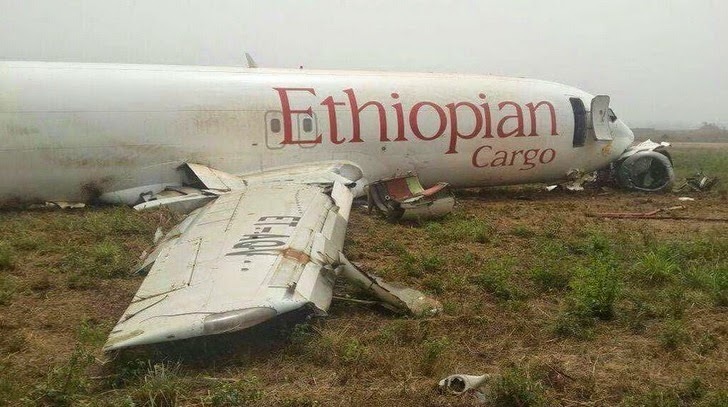 Ethiopian Airlines is top rated in Africa and has one of the continent's best airline accident records. As of January 2014, the Aviation Safety Network has recorded 60 accidents/incidents totaling 322 fatalities since 1965. Other resources also stated that, this incident has prompted members of the public to begin asking questions on safety standards at the Kotoka International Airport. In 2012, a Nigerian Cargo plane skidded off the tarmac and run into a passenger vehicle killing about ten passengers.